Can you feel the spring vibes or what?? Funny thing is, my food these days totally looks like spring, but my environment is still looking like winter. I could complain for days about it, BUT I am choosing to be super positive, and just be like, “ahh, whateves”. I mean, we can all pretend right?? This is one of those recipes I have been thinking about for a while now. 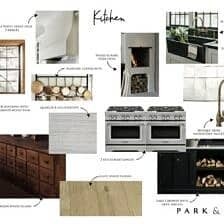 Well, not that long, but for about a month now I have been dreaming of making a fresh green pasta with zucchini noodles and heavy, heavy Greek flavors. I just needed to wait until the right time, and well, I have decided that waiting is zero fun and it’s time to share! I actually made and photographed this a couple of weeks ago, but I have made it three times now since. It’s seriously that good… and that easy! So much so that it completely annoys me when my mother says she is excited about all the snow we are having this week. Like is she crazy?? YES. She is that person that is so into the snow and I just do not get it. I mean, I get it at Christmas time, but not in mid March when things should be thawing out and buds should be popping up and outta the ground. You know? Breathe Tieghan… ok, again, thinking positive thoughts. It really is my new thing. I’m really not the most positive person in the world. I can also be pretty hard on myself, so my goal these days is to just try to stay happy!! Fake it till you make it…? 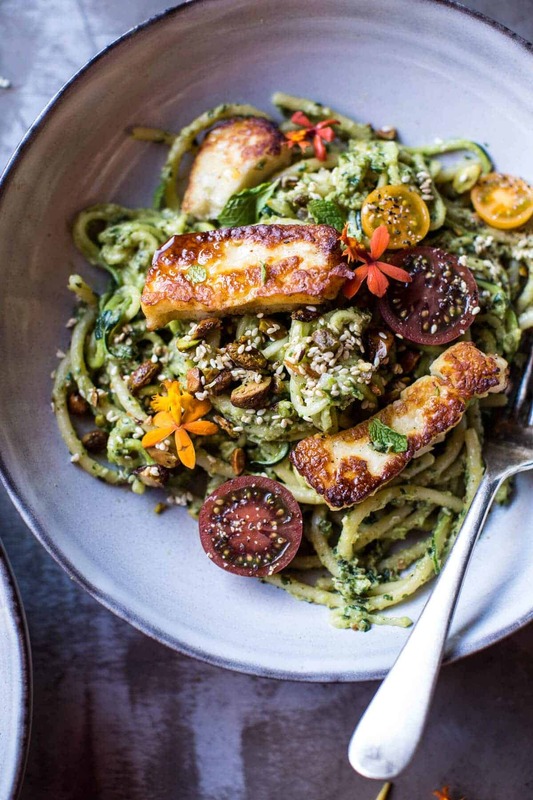 But this Green Goddess Zucchini Pasta!! Let’s chat about it. This is actually a mix of REAL pasta and zucchini “pasta”. I’ve said this before, but I am just not the kind of person that can eat a bowl of zucchini “pasta” and be left with a happy tummy. Nope, I need carbs. Carbs are my friends. They give me energy and make me feel all happy and full inside…gesshh a lot of happiness going on in today’s post. It’s the bowls of pasta…happy vibes are hard to resist when bowls of pasta (with fried halloumi cheese) are involved. Anyway, this pasta is the perfect dish to enter us into spring. 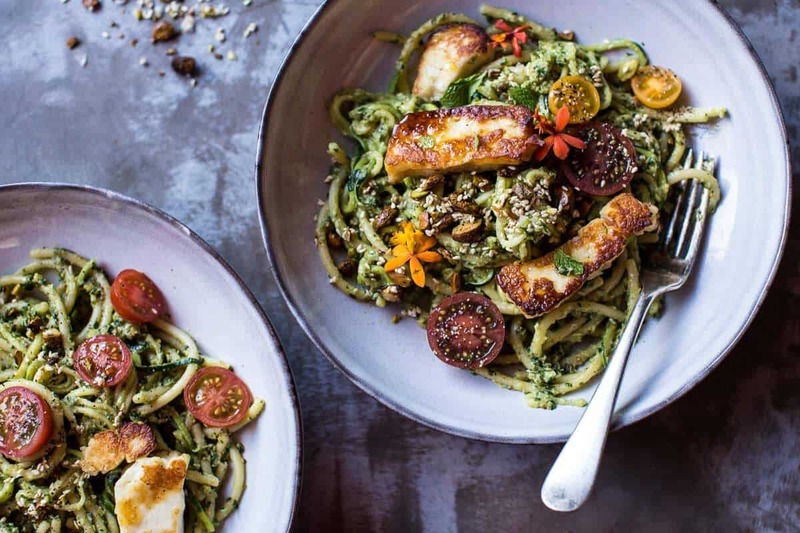 It’s simple, quick and loaded with things like avocado basil pesto (THE BEST), zucchini, fresh heirloom cherry tomatoes, fried cheese (EVERYTHING) and toasted nuts + seeds. You can easily adapt it to be vegan or bump up the protein and add grilled chicken or roasted chickpeas. Can we talk about few key factors to this recipe though?? …first, the avocado basil pesto. Um, this may just be my new favorite sauce/dip/spread for toast, crackers, pasta and everything in between. It’s kind of amazing. I used a combo of basil + mint + pistachios, but the thing that really makes this pesto is the avocado. It gives the pasta a creamy texture without adding any cream. You’d think that the pesto would turn brown after a while because of the avocado, but the acid from the lemon keeps it bright and green. Granted my pasta has yet to last longer than twenty-four hours in my kitchen, but I think leftovers should be good for a couple days…pretty sure it won’t last that long in your kitchen either though. …second, the fried halloumi cheese. Legit, this is the best thing ever. Fried cheese is always, always a good idea.? truth. …third, the crunchy seeds + nuts. I have been doing this with a lot of dishes lately, but it’s just so good. Cook your favorite nuts + seeds in a skillet with a little olive oil + a pinch of salt and then sprinkle them atop everything. SO GOOD. …fourth, this pasta is literally so easy to make. Add all the pesto ingredients to a blender or food processor and blend. Toss the pesto with hot pasta, fry your cheese. EAT. OK and lastly, not only is this super springy, but… its GREEN food! Meaning, it’s kind of perfect for this week, seeing as tomorrow is St. Patrick’s Day!! Is anyone doing anything fun? Are you making Corned Beef? Going to a parade? Starting your weekend a day early with one too many Irish Coffees? Totally thinking a bowl of Lucky Charms for breakfast (once a year, gotta have my Lucky Charms…but minus the marshmallows cause I weirdly was never into them), green pasta for lunch (duh) and then dinner is kind of undecided, but it’s between these Corned Beef Tacos, this Irishman’s Mac and Cheese and tomorrow’s recipe…be excited its cheesy! Mini Chocolate Stout Brownie Sundae Floats with Irish Caramel + Hot Fudge. Obviously. A fresh green pasta with zucchini noodles and heavy, heavy Greek flavors. 1/2 pound spaghetti or use gluten free if needed OR more zucchini "noodles"
Bring a large pot of salted water to a boil. Boil the pasta according to package directions. Just before draining, reserve a cup of the pasta cooking water. Drain the pasta and add to a bowl with the spiralized zucchini. In a food processor or high powered blender, combine the tahini, garlic, avocado, lemon juice, pistachios, basil, mint, jalapeno and olive oil. Blend until you have a pesto like sauce, adding more olive oil if needed to thin. Add the parmesan and season with salt + pepper. 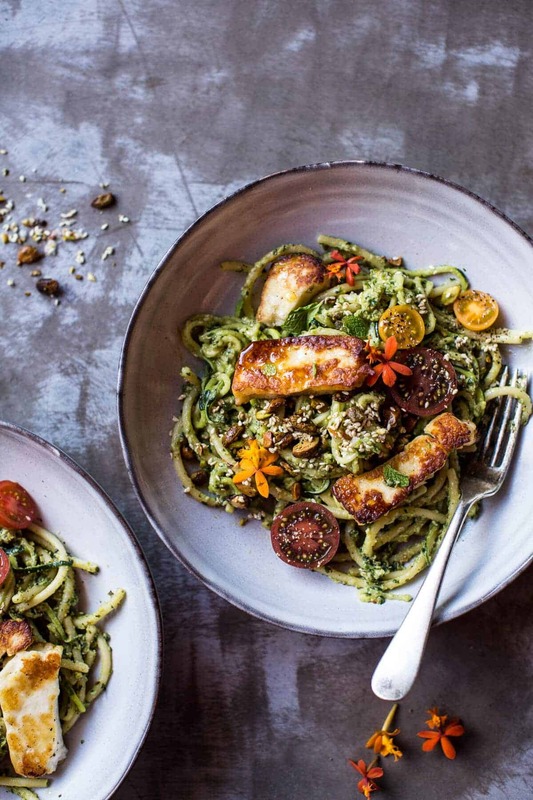 Pour the avocado pesto sauce over the hot pasta + zucchini. Toss well to combine, thin the sauce with pasta cooking water if needed. Heat a large skillet over medium heat and add a drizzle of olive oil. Once hot, add the Halloumi slices and cook for 1-2 minutes per side or until lightly golden. Remove and drain on paper towels. Divide the warm pasta among bowls or plates. Top with the halloumi cheese, tomatoes and seeds. EAT! *If you do not have a spiralizer just thinly slice the zucchini into matchsticks. Nothin better. Go big or go home. ? 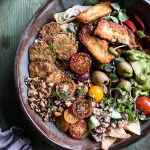 Greek Goddess Grain Bowl with “Fried” Zucchini, Toasted Seeds and Fried Halloumi. I am totally in love with this pasta! 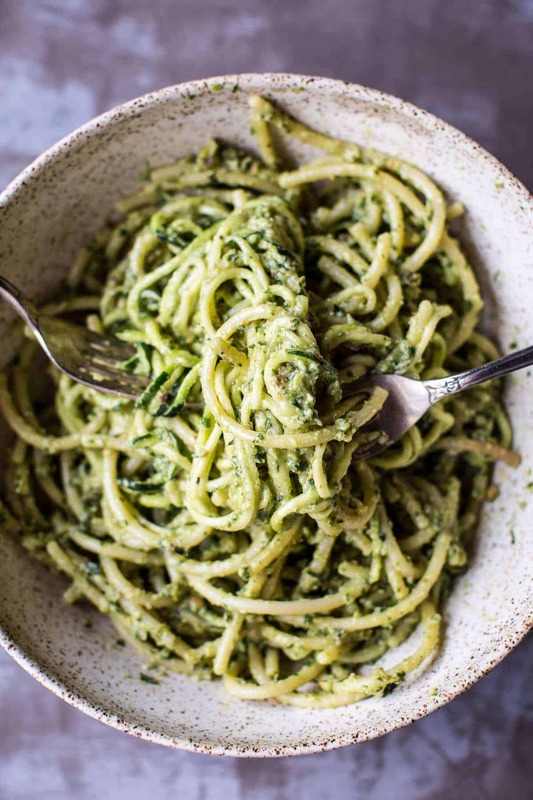 Zoodles are the best and pesto is one of my favorite things on the planet! This is perfect for St. Pattie’s Day! 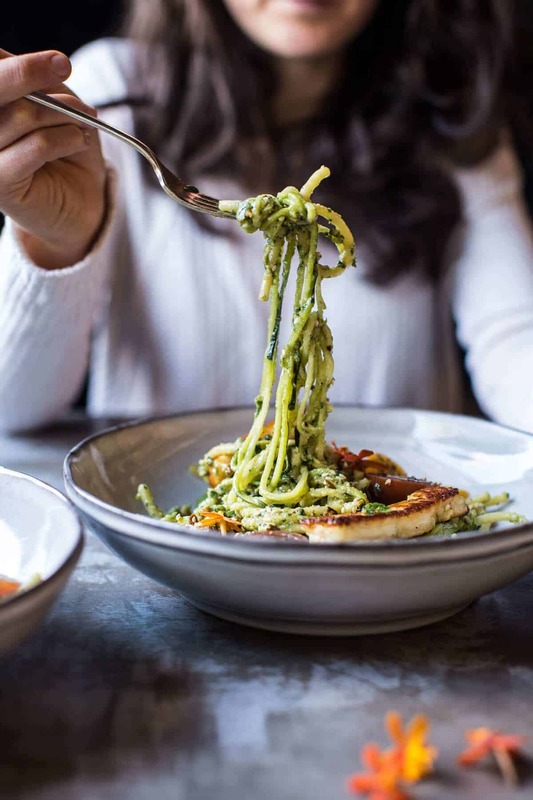 I love how you combined the zoodles with real pasta, cause we totally feel the same about carbs as you do! 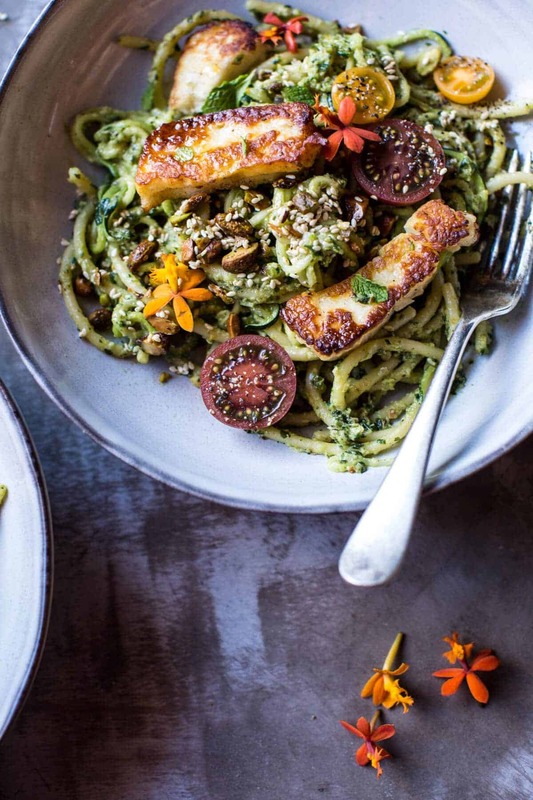 I often make an avocado pasta sauce, it’s just too good and makes me feel a little less guilty about eating a creamy pasta sauce 🙂 Oh yeah and halloumi = LIFE. I’ve been addicted to zucchini lately, NEED to have it almost eve day ( now that I think about it, it started with your zucchini miso bowl..). I think this is going to be my new staple for the next year. I am already starting my garden, can’t wait for my basil! 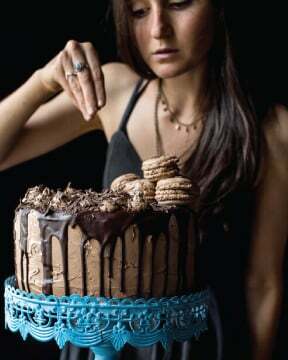 Oh my green goddesses, this looks so delish. Love the combo of zoodles and real spaghetti, lighter on the carbs but still filling and well, spaghetti right? I never had Haloumi before but this definitely makes me want to try it! Zoodles are so versatile, great shots as usual. Do you cook the zucchini noodles first? If so…how? You can’t beat fried cheese…. 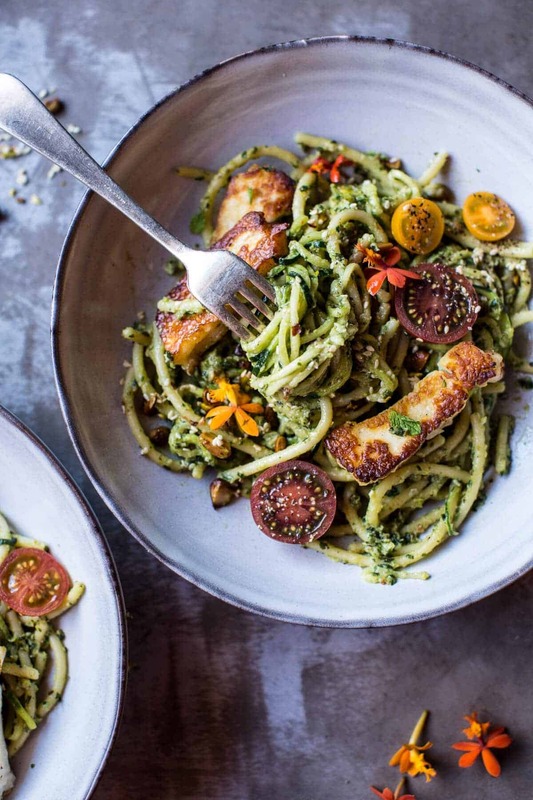 I haven’t had lunch yet and this has got me seriously salivating… I’m totally with you on the carbs thing, I just don’t feel satisfied without them so if I’m doing courgetti I always do a mix with spaghetti. 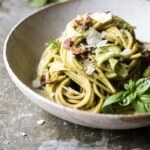 The avocado pesto sounds amazing, I make a lot of pestos but I haven’t tried an avocado one yet. I’m liking everything about this Tieghan and I’m all about that sauce! 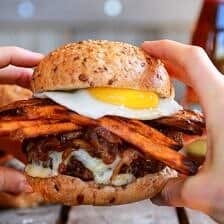 This is just perfect and it makes me so hungry! Love the photos! I’ve never tried mixing pasta and zucchini noodles before! I’ll have to give it a go, and that fried halloumi ?. My mom tells me I used to cry every March when it would start to snow again (she does this every time I talk fondly of living in a state that got regular snowfall). 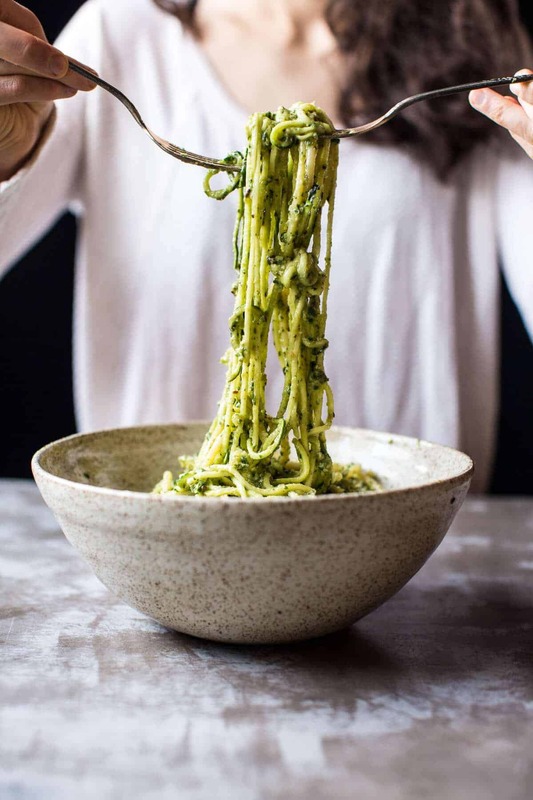 I love the idea that you’re using both real pasta and zucchini noodles, that’s a perfect combination. The looks of this dish is just decadent so need to say no more. This dish looks so delish! I have put it on my list of recipes to try. I have never tried halloumi, but I love all cheeses so I’m super excited. 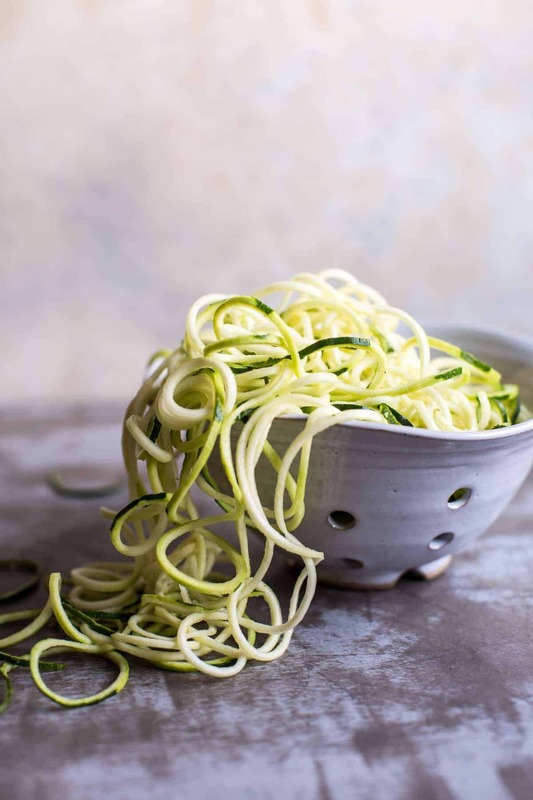 Love the spiralizer – love Zoodles – Just sent this to my Italian cooking hubby and voila – that’s what I get for din din tonight – Your timing is most excellent! Hope that unwelcomed snow melts stat – bring on the Crocus! Thanks for yet another gorg and inspired dish – you have the shine Tieghan! This looks so delicious! I love that you combined the spaghetti with the zoodles. This one is saved and we’ll definitely be trying it! I love everything about this dish…I’m with you that zoodles don’t replace pasta but combined with pasta they are super delish. Did you have a hard time finding the halloumi cheese? I’m not sure I’ve ever seen it in the store. Hold me. I just fell in love! Anything with halloumi gets a major thumbs up from me! 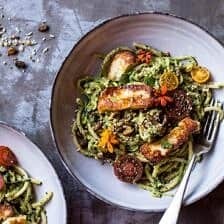 I love the idea of mixing zoodles with regular pasta so you get a little bit of health and a few delicious carbs too. I thought that the fried cheese was tofu! It looks to DIE FOR. I love the way the zoodles are seasoned with the pesto and the way it complements the cheese. This looks fantastic! That chunky sauce looks amazing! Just gorgeous and I’m all about that fried halloumi topper! So seeing as the pasta is made out of zucchini – aka healthy – does that mean I can have extra haloumi? Looks amazing! YUM! I haven’t checked in for a few days and look what you’ve done! So funny I sat down with my dinner bowl full of spiralized veg noodles with cilantro green sauce…and whoa! you already beat me to it! Please tell me what spiralizer you use. I have a crappy hand held one that I threw away in disgust after I finally finished making this batch of ‘noodles’. I’d really love to have a good model. Did you know KitchenAid makes a spiralizer attachment? Only $229!! I think I might just be haloumi’s biggest fan, if my consumption of this squeaky, savoury, salty cheese is anything to go by. So, Tieghan, I LOVE you for making this dish, and I just know it will be in my mouth super soon! Like, tomorrow. 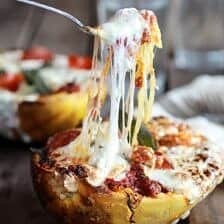 My husband and I just had this for dinner and it was fantastic!! We try one new recipe from your website each week and we have yet to be disappointed! Thank you for all the food adventures that you give me and my best friend! Made this for dinner last night and it was incredibly good! It came together in under 30 minutes which was even better since we started cooking at 8pm haha. We did part zucchini noodles and part spaghetti squash (no pasta) and it was definitely a treat! As always, thanks for the recipe, Tieghan! Made this tonight for 6 year old, 3 year old, husband and me. Everyone loved it! (Spiralized noodles topped with crunchy salty nuts = win for the kids) I made it with quinoa/brown rice pasta from Trader Joe’s, blanched the zucchini in the same water for the last 2-3 minutes, and used a whole avocado (why not?!). Oh, and just for color and kicks, I added a head of purple cauliflower roasted with salt and pepper until it caramelized… scrumptious. So many flavors and so fresh! Definitely going into the rotation. 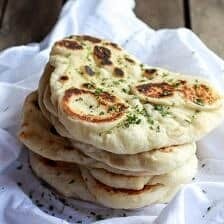 This was my first recipe from your site, can’t wait to try more. Awesomely rich weeknight dinner – and the fried halloumi put it over the top! We are definitely going to save this recipe! It will be perfect to make again with fresh summer basil. I just made this for supper, with a few tweaks to make it simpler. But the general idea was all yours. Thanks so much for a delicious supper. So happy you liked it!! Thank you! I’ll check it out right now! This was absolutely delicious! Used veggie linguini with the zucchini noodles and the mix of textures was spot on. I would have never thought of mixing pasta with zucchini noodles, but I’m a big fan. The sauce was to die for and anything with halloumi is a must try for me! Thanks again for another great dish! yay! So happy you liked it! Always halloumi anything is a try for me too! Made the sauce for roasted veggie sandwiches. OMG. The flavors, the texture, absolutely delicious!!!! Will make this again and again, as usual, with all of your recipes. I omitted the nutritional yeast and jalapeño. Ah, so happy you liked it Shoshanna! Glad it was good without the yeast and jalapeño. I made this for Mother’ Day lunch and then did grilled pizza for dinner. We are all rolling with full stomachs even this morning but I had tell you how spectacular this was. My nephew can’t have gluten so I made it with Barilla gluten free spaghetti and it was so yummy. My husband looked at me funny when I told him we don’t cook the zoodles but just mixed them together. He became a believer after tasting it. Used pignoli instead of pistachios since that’s what I had on hand and everyone loved the YUMMY creamy flavor and the different chewy, crunchy textures of the dish. It was so quick to make to boot! Doubled it for 5 people and I have very little leftover. Way to go TIeghan! Thanks for another wonderful meal that’s getting filed away in my favorites recipe box. This is so amazing! I am so thrilled your day went great and everyone loved this pasta! Thank you so much Rose! I hope you love it Savannah! Thanks! Oh so much deliciousness! 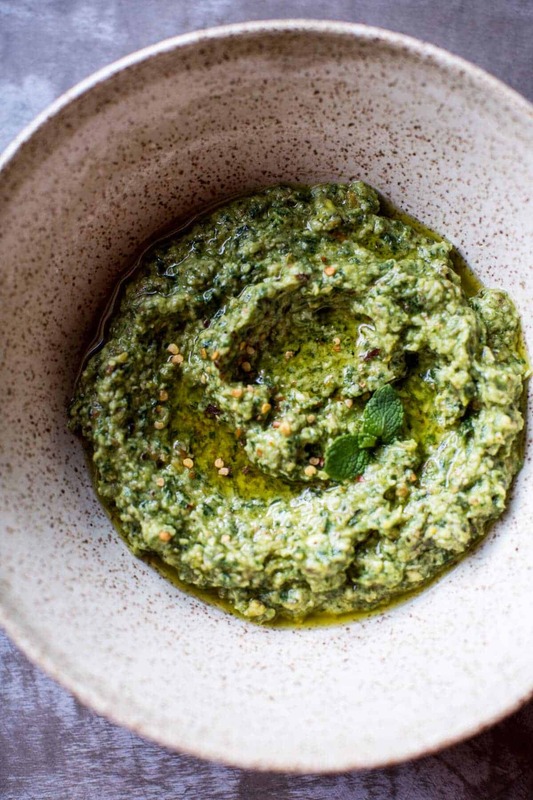 Can the pesto be made a day ahead of the meal? Thank you! Yes, the pesto can be made ahead of time. Let me know if you have any other questions. Hope you love the pizza! This is one of my favorite halloumi recipes. One thing I always add is fresh corn – the sweetness is great with the saltiness of the cheese. So happy you like it Lisa!! Adding corn is so good!! 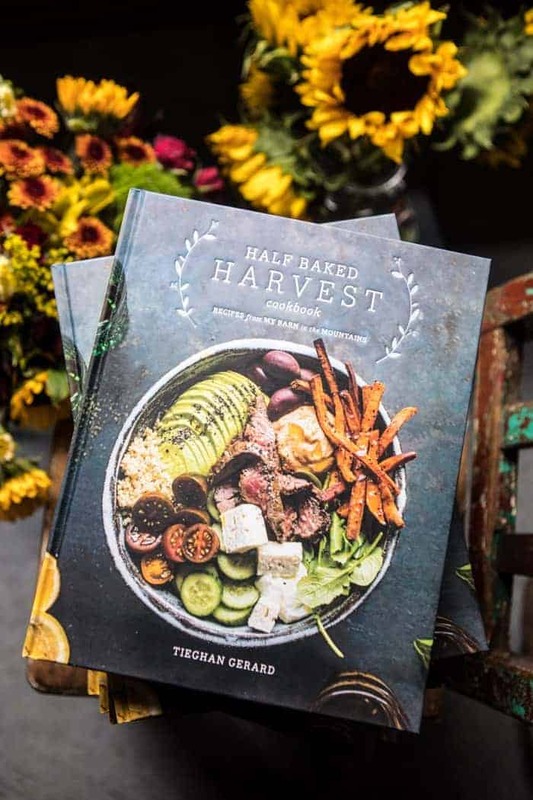 Tieghan I am in LOVE with your blog! 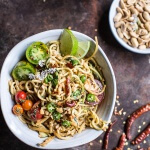 your 20 minute better than takeout noodles, the pumpkin laksa and this recipe are my go to recipes when I want a quick but delicious meal. I also made your strawberry cobbler recipe yesterday which turned out great! 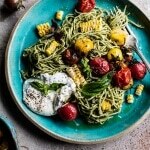 I had a quick question about this recipe – I don’t like the thought of the raw zoodles how would you recommend cooking them and for how long? thanks again! I’m a terrible cook and fail at most things, but I just made this and it was insanely amazing!! I added grilled asparagus and cherry tomatoes, yum yum yum! Thank you so much for the recipe!